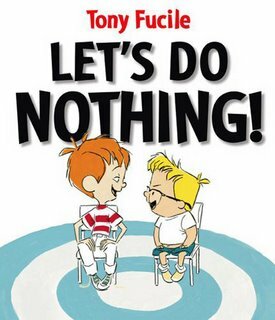 VNOG Blog: Let's Do Nothing! I hate to recycle other people's blog posts, but I wanted to spread the word on this. Jim Capobianco's Leonardo blog mentions a new children's book by animator Tony Fucile (Incredibles, Iron Giant, etc.) coming out this week. It's called "Let's Do Nothing", and there's even a trailer animated by Fucile himself! The book's publisher has posted an interview with Fucile here, in PDF format. I've been teaching art to my mom's first grade class... this would be a cool book to surprise them with!